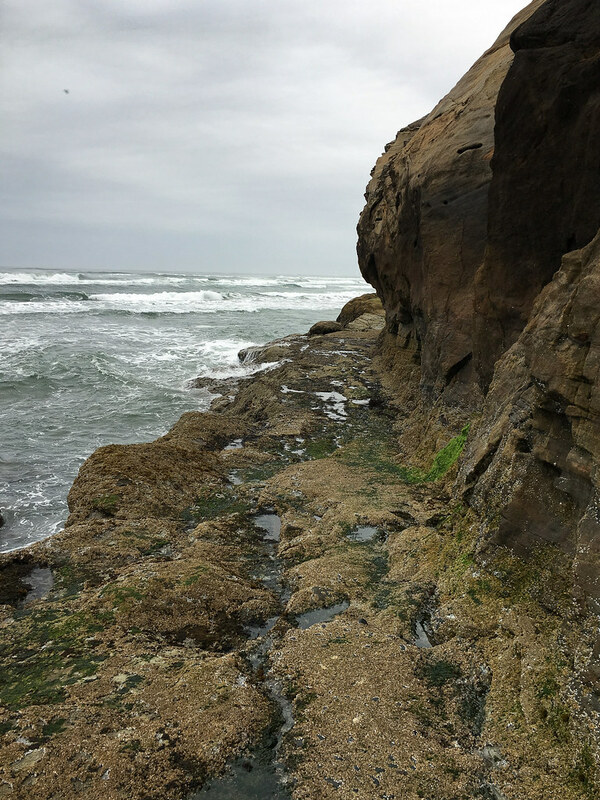 This uneven exploration sweeps from the historical shallows of my private connections to the the intertidal, to the depths of the remote Miocene, and back. Better said, I’m taking this opportunity to share a haphazard set of anecdotes about me, my home beaches, and theoutershores. Surfperch were my gateway to the intertidal. I developed my connections to intertidal nature fishing the surf. 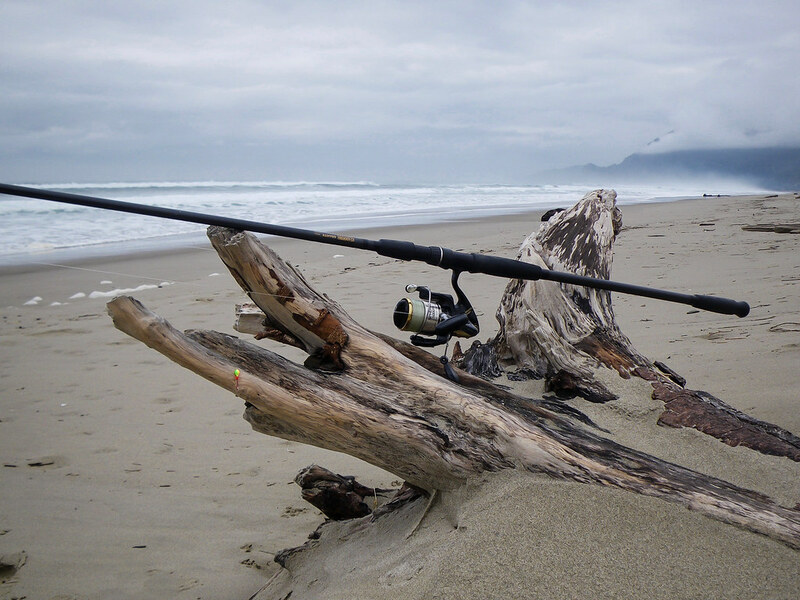 My earliest posts, like And the King of the Surf is… came from angling on Oregon beaches. In Surfperches, I devote a whole page to surfperch diversity. The rod pictured above is an 11-footer I built a few years ago. It can throw three ounces with ease. It’s fishy, but not the fishiest rod I use. Nowadays, if I fish at all, I use lighter gear if I can get away with it. If you want more history about me and theoutershores, About theoutershores is a tell all. Pictured above are Miocene sediments laid down over five million years ago. An unfathomable reckoning. What bygone forces of climate, weather, sea level rise and fall, and uplift shaped this shelf? It’s a privilege just to pass by these silent sediments. Honeycombed by burrowing clams, I can’t help but wonder if the excavations are the work of ancient or modern burrowers. More photos and a description of this worthy shelf appear in Boring Clams Lend an Otherworldly Appearance to a Miocene Shelf. Right around the corner and on the same headland as the Miocene shelf, a more recent story can be told. 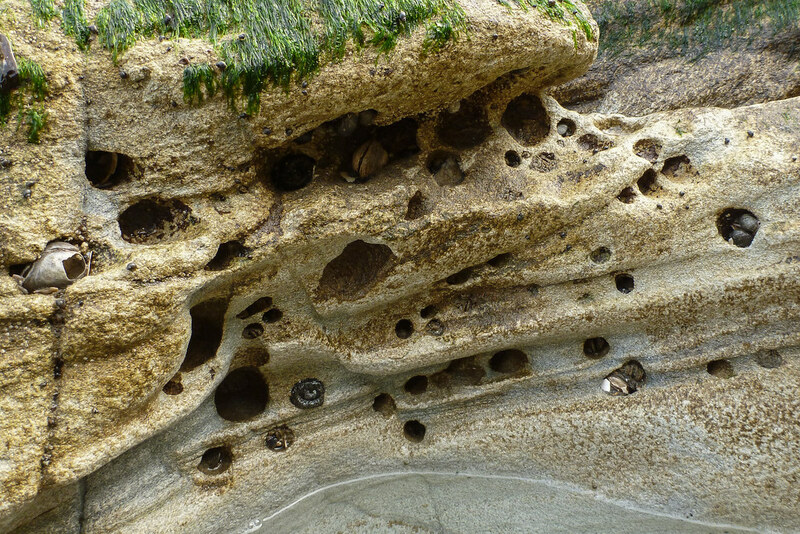 The image above is the old roadbed rounding Hug Point. It dates back to at least the first decade of the 1900s. Until the 1930s, except at the lowest tides, it was the only passage for vehicles traveling between Cannon Beach and Arch Cape. It looks a bit treacherous today, and so it must have to early travelers. See more history and photos here. Every ocean drifter has a history and a story. 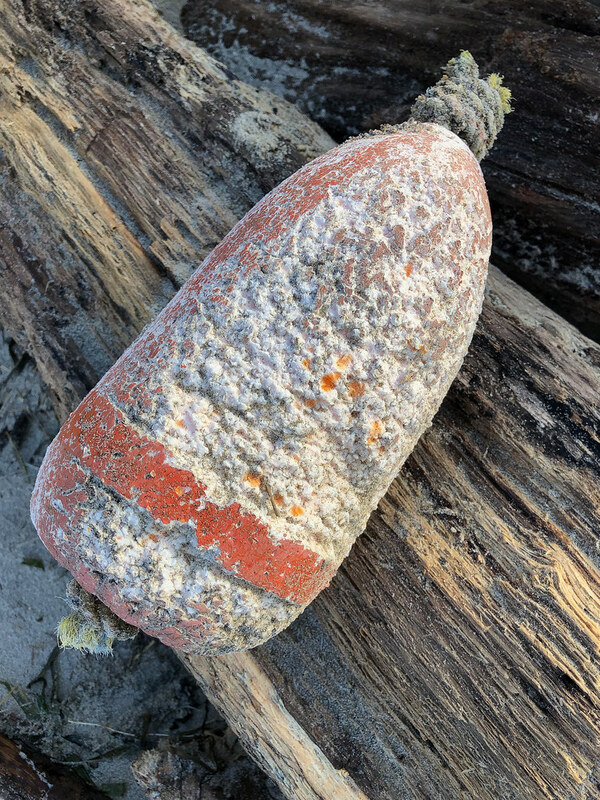 What tales could this lost buoy tell of its travels? In A Jar’s Journey I try to solve a drift line mystery. My Wrack Line pages are filled with driftline discoveries. Of tales to tell, this venerable chiton might have some. Weathered and cracked by forces of surf and sand; years spent, in all likelihood, on the very rock pictured above. 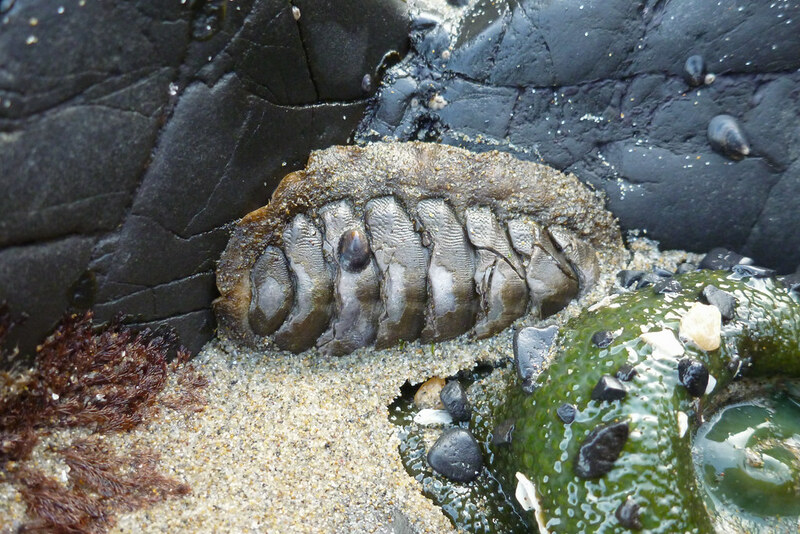 Chitons is my take on some common Oregon chitons. Last spring and early summer, this bull kelp was a slender fast-growing frond undulating to the rhythms of subtidal surge. 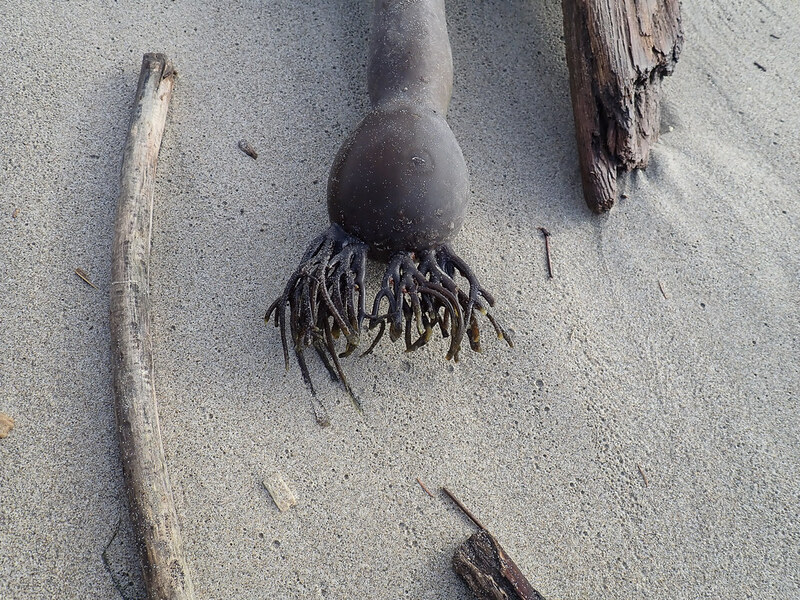 By winter, a washed up still life. So goes the brief history of an annual macrophyte. Bull kelp’s connections to the shore are highlighted in Bull Kelp Drift: A Subtidal-to-Surf Zone Connection. This winter I measured the highest spring tides against this old stump. It’s been a reliable landmark since 2010. Now a beached relic, it has a history in a distant maritime forest. Standing Solitary in the Swash is a tribute to this old friend. 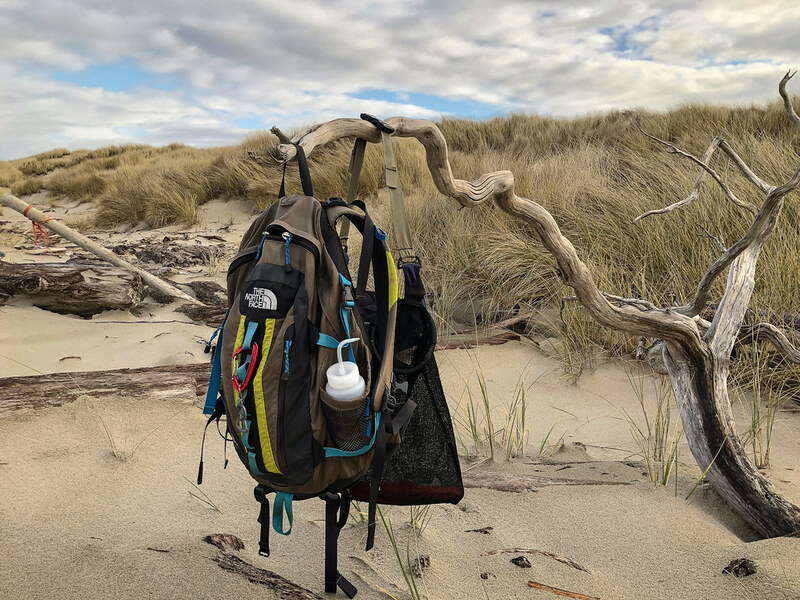 This history ends with another old friend, the pack that has accompanied me on every beach adventure since 2009. 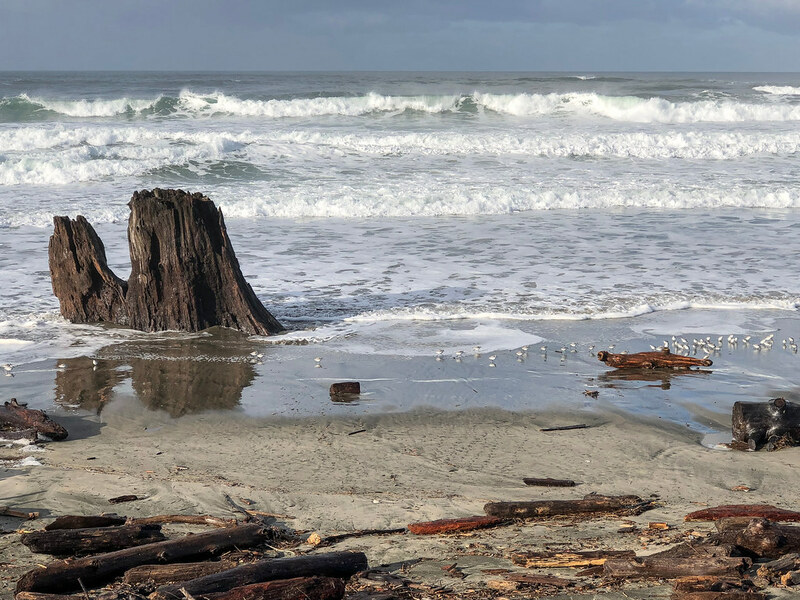 Here in February 2019, waiting along with me at the base of the foredune for one of those especially high spring tides, it’s as photogenic as ever. In A Betrayal of My Backpack: Its Contents Revealed, I show photos from over the years, and explore its hidden contents. What better compliment than that? Thank you. San Diego beach memories must be some of the best. I’ve rarely made it down that way, but I hope to. History and memories are beautifully expressed through your post. Thank you Amy. It was a fun challenge. I can’t wait to see what you have in store for us. Beautiful images and thoughts on the seashore and its inhabitants. It’s a true slice of history, isn’t it? Your challenge really go me thinking about that very question. Thank you for the effort you put into Lens-Artists. I’m so glad that our challenge gave you “food” for thought and inspired you to create the post. We’re delighted that you’re joining us! Lovely! Great summaries that call for further visits and exploration. Thank you so much! Speaking of further visits and explorations, one of my goals is to get down your way. I’ve only been down on the south coast, at Bandon, once! So beautiful. Bandon is grand. I really need to resurrect the favorite shots I had from the years I lived near it. These days I’ve moved farther south and think the Samuel Boardman state scenic corridor more variety and spectacular scenics. It’s definitely worth the drive down this way! IMHO. Beautiful post – history is different, but still the same. Even backpacks have one…Great shots as always. Even backpacks! Thank you so much. Enjoyed your history lesson very much and loved the backpack ending. We explored the Oregon beaches 2 summers ago. magnificent! Thank you Tina. I’d love to spend a summer just exploring the beaches. I’ve only touched a fraction. All of this is GREAT. You inspire me to look for oddities on shorelines. Consequently I take a lot of photos of things no one else notices. Thanks Trish, so kind of you to mention it. Enjoy your trips to the shore!